The McElwain Farm was purchased in 1910 by David McElwain after emigrating from Canada with his two brothers, Frank and John. Frank established a blacksmith business in Presque Isle, and John began a farming operation in Caribou on the south side of town. John's farm house is now a historical site and home for the Northern Maine Regional Planning Commission. David McElwain farmed potatoes, hay, grain, and raised a variety of farm animals. He was very proud of his work horses that he used in the fields. His son, Ralph, got involved in the farming operation while attending the University of Maine in 1942. Over the years, Ralph farmed potatoes, sugar beets, grain, beef cattle, dairy cattle, and turkeys. Ralph and Adrina's daughter, Betty, operated a fruit and vegetable stand to help pay for college from 1971 - 1974. The stand was revived and expanded to include bedding plants and pumpkin sales from 1986 - 1990, as Adrina and Ralph became semi-retired. In 1985, Ralph and his son Frank, formed a partnership to grow strawberries. They farmed together until Ralph's passing in 1999. 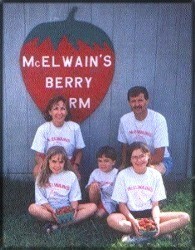 Today, the strawberry venture continues and involves Frank's wife Joan, and their children Diana, Lauren, and Spencer (pictured at right). Legend has it that we can thank clever children for naming of the sweet red strawberry. After picking the fruit, children strung them on glass straws and sold them "by the straw" or "straw of berries". Another theory is that the name represents the spreading nature of the plant runners which are strewn, or anciently "strawed," over the ground. The English "strawberry" comes from the Anglo-Saxon "streoberie," not spelled in the modern fashion until 1538. Although strawberries were gathered from the wild, the development of the strawberry as a commodity didn't occur until the 1820's in England. The large, beautiful, wonderful tasting strawberries of today (Frangaria x anannassa) are the result of hybridization. The commercial strawberry comes from the cross of two wild American strawberries: the Eastern Meadow Strawberry (Fragaria virginiana) and the Beach Strawberry (Fragaria chiloensis). The Eastern Meadow Strawberry was taken by early tradesmen from Virginia and planted in the gardens of Europe as a novelty. In 1700, a French botanist named Frezier transplanted the Beach Strawberry form its native home, in Chile, to France. 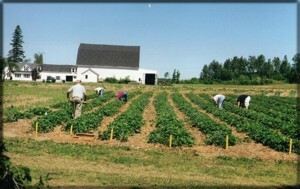 When the Beach and Eastern Meadow strawberries were planted in the same garden, a natural cross pollination occurred. The result was a new superior breed of strawberries that bore large delicious fruits. With rare exceptions, every commercial strawberry on the market today arose from the hybrid cross of these two wild types.